This year's spring nail polish collection from OPI is Texas-themed. I've never been to Texas but I have a lot of Texan friends... I wonder what they'd have to say about these shades? Any Texans want to weigh in on them? Austin-tatious Turquoise. You know, this looks like such an amazing color in the bottle and it looks pretty great in the picture... But it's actually a freaking nightmare. The color is great- a sheer turquoise glass fleck shimmer with subtle pink duochrome... But the formula! Oh, the formula. It's sheer and watery, a combination that can only spell disaster. What you're seeing here is SIX COATS. Six watery, runny, goopy coats. The color is dustier and less vibrant in real life. If you want something similar (glass fleck duochrome turquoise) without the weird formula, try Nicole by OPI Iceberg Lotus. EDIT: I've been receiving reports from people who own this color, and a few of them say that their bottle isn't watery and sheer like mine. However, the majority of people I've heard from say they have watery bottles like mine. It seems like there are multiple batches of this color floating around. Don't Mess With OPI. Nice dusty medium green. I like the muted quality of this, it's not your standard green creme. It's like if OPI Jade Is The New Black and Rescue Beauty Lounge Orbis Non Sufficit had a baby. It's Totally Fort Worth It. Very, very hard to capture the finish of this color. It's not just a plain silver shimmer, it has tiny pink-red sparkles! You can see some of those elusive sparkles in the middle of the bottle on this picture. It would be my favorite color of the collection if it weren't for the sheer, watery formula. This is four coats. I Vant To Be A-Lone Star. I'm not understanding the name of this. I get the "Lone Star" part, but 'vant'? Is that like a Green Acres reference or something? Wait, did Green Acres even take place in Texas? Eh... guess it doesn't matter. The color is nice. Light greyed-out blue with silvery shimmer. Tranquil and serene. Reminds me of another ancient discontinued OPI... drawing a blank on the name. San Tan-tonio. Light milky brown creme. Surprisingly flattering on my cool skintone. Makes me think of suede. Suzi Loves Cowboys. I used flash on this color because it looked too black in natural light. The flash shows the base color and how it looks in sunlight. It looks about two shades darker in dim light. It's just a dark chocolate brown creme, nothing too exciting... But very unusual for spring! Now for the surprise: the jellies sorbets. Big Hair, Big Nails. A red coral, or a light cherry sorbet. Do You Think I'm Tex-y? A deep beet pink/purple sorbet. Guy Meets Gal-veston. A medium orange coral sorbet. Houston, We Have A Purple. Haha, my favorite name out of all of them! This is a deep magenta borderline purple sorbet. Y'all Come Back, Ya Hear? A medium orange sorbet. Now, OPI is really pushing this "sorbet" finish pretty hard lately. They describe it as a completely new finish. It's a semi-sheer or translucent wash of color which has the effect of looking like hard candy or popsicles... If you've been into polish for a while, this should sound familiar, because it's what we polish junkies know as a "jelly" finish. Jelly polishes have been around for a long time, but they're not very common. Despite the whole "It's not a jelly, it's a sorbet, it's brand new!" thing, OPI does this finish really well. I mean, just look at them, they're beautiful. You may not be able to pick up on the jelly effect of the finish from my pictures, but the finish is really spectacular. It's not so sheer that it looks clear, and it's just translucent enough to look soft and squishy. The colors they chose are vibrant and candy-like and they're perfectly suited for the jelly/sorbet finish. Initially, I did not have high hopes for the sorbets. They all looked like boring colors and I thought they would be too sheer. And, as usual, my mind changed once I actually put them on my nails. They're lovely. I did three coats of all and I think they're perfect. The formula on this collection is varied. The sorbet/jelly shades are nearly perfect, only a little on the thick side. The other six shades are watery, runny and sheer. I had a really hard time applying them with Austin-tatious Turquoise being the most difficult and I Vant To Be A-Lone Star being the easiest. The brushes were inconsistent and uneven in shape, size and smoothness. Some were rough, a few were normal. I am used to OPI having a very consistent and reliable formula, this collection is hopefully just a fluke. I'm torn on my opinion of the collection overall. I had written off the sorbets before I even tried them and they ended up being my favorite part. They're very spring/summer appropriate predictable colors, but the sorbet finish makes them wonderful. The other shades seem too random. There doesn't seem to be one cohesive theme within the color range. You've got brown, green, sparkly turquoise, silver.... They just don't mesh well. And they're a little bit sleepy, I have to admit. Though, I've realized that OPI's spring collections have been very sleepy for the past few years and the summer collection is the exciting one. Also, the names are starting to be a little too ridiculous. Some are cute, but others get dangerously close to Misa-level cheese and length. I did really love "Houston, We Have A Purple."... I'm still giggling about that one! So, overall, the new sorbet polishes are definitely worth trying on if you get the chance. If you've never tried a jelly finish polish before, you'll probably be delightfully surprised. People with longer nails may have issues with visible nail line, but if that doesn't bother you, you'll probably love them. The inconsistent, watery formula on the rest of the colors turns me off to them a bit, but Don't Mess With OPI and It's Totally Fort Worth It are worth the frustration. My sister and I were taking a trip to Austin right after these were released so I just had to get Ausin-tatious Turquoise and I must say that I didn't have a problem applying it and got the same effect as your 6 coats in 3. Maybe you just ended up with a bad bottle...? I only mention that I didn't have the same amount of trouble because the color was really great and unique and wore well too, and I'd hate for people to be turned off from it because it seems like a hassle. I even later did a reverse french manicure with that under Lippmann Don't Tell Mama, and it did well then too! At the risk of showing my age, that would be a reference to a famous quote of the swedish actress Greta Garbo "I vant to be alone". I don't think she is connecte to Texas in any way however. The OPI folks must be running out of ideas. Great swatches though, thanks! I think my fave would be Y'all Com Back. re: I Vant to be a Lone Star is a reference to Madeline Khan's character in Blazing Saddles. It's pretty funny actually. Thank you so much for posting these. I think overall, the collection is a big yawn. I only bought Suzi loves Cowboys cause I wanted a neutral brown creme (not a red brown one). I do like Ya'll come back Ya Hear, but I can get the same color in a creme version and I'm done. OPI hasn't done anything impressive lately, IMO. It's a pity cause they used to be my fave brand...luckily I have Nails Inc to keep me happy. @d'Olivia don't think of it as showing your age, think of it as showing your knowledge! But yeah, they do seen to be running out of ideas when it comes to names...but now that I've seen "Do You Think I'm Tex-y?" I think I'll pick it up. I'm so glad this collection did absolutely nothing for me. I hate VNL and I don't have much patience for anything more than two coats, so though I love the colors of the "sorbets," they are out. And the others are just kind of fug to me. Oh well. Great photos as usual. It seems like they actually tried with this collection, so I'll give them credit for that. But half of the collection being pinks and corals that they're pimping as a new miracle formula that isn't new, and then they waste other slots on polishes that need 4-6 coats and are a nightmare to apply...*shakes head. * Seriously, if I can't get it in 3, I call the formula a failure. Yeah, I'd also guess that vant comes from the scandinavian/german languages, where w is pronounced v. I like the Do You Think I'm Tex-y name though. Thanks for these swatches, I had been waiting for a blogger I trust to do the sorbets. I just ordered Guy Meets Gal-veston and now I think I want Too Hot Pink To Handle. The sorbets are fabulous for gradient manicures too. I used GMG over RBL Underware and it's a gorgeous neon pink to deep pink to orange coral mani! I Vant To be alone is Greta Garbo's famous quote. The Blazing Saddle thing was a play on that. That color and the green are the only two I am even halfway interested in from this collection. I am not a fan of jellies. I r from Texas. Some of the names are cute, some are just stupid. Big Hair Big Nails being one. Sounds like a stereotype to me. I'm from Dallas, so I would have loved to see a Dallas polish. There is Fort Worth... which is direct next to Dallas. And there is Suzi Loves Cowboys, but that could another stereotype referencing how Texas hasn't changed and has nothing but rednecks and "cowboys". Plus its called Suzi Loves Cowboys, not Suzi Loves the Cowboys. I spent many years living in Texas and felt that these colours really didn't represent the feeling of the state. Texans are a very proud people, and many consider Texas kinda its own country. :D They'd be right! It's definitely a different culture, even than the rest of the south. For them, it's Texas first, America second, in their hearts. In Texas their flag is EVERYWHERE, no exaggeration. I'm surprised the colour line didn't incorporate that more. Perhaps they figured those reds and blues had been done before? Anyway, I would have thought there'd be earthier, dustier colours. More leather, more brass spurs, something to represent warm nights and blistering days. I'm surprised they didn't do a Houston one. Or OIL!! Texas is oil country! Who doesnt want a oily-looking chrome? Why isn't there one with star glitter? There seemed to be too many generic berry or fruit colours. The light tan brown is great. The green (Dont Mess with OPI) reminds me of the cacti and the lizards and the light blue (I Vant to be a LoneStar) is a GREAT endless sky colour, the orange (Ya'll Come Back) reminds me of all those Texas ladies with their "Ive been in a tanning bed my entire life" skin... but the rest? Meh. I love your blog and the photos are fantastic!! I have "Dont Mess" and "Ya'll Come", but I still want to get "San-Tan-Tonio". I love San Tantonio, but the rest...not really my cup of tea. I wish they were more opaque. I live in Texas and love this collection! I'm dying over the sorbets. They are just juicy goodness! I passed on this entire collection. The only one that caught my eye Austin-tatous Turquoise but it didn't seem special enough to spend money on when I'm on a low buy. You're the only one so far that I've heard say it takes 6 coats but holy cow!!! I draw the line a 3 coats, any more that that and the polish is a looser in my opinion. I have 'Don't Mess With OPI', 'Do You Think I'm Tex-y?' and 'Austin-tatious Turquoise'. I have the same issues with DMWO and AT; watery, runny, streaky formula that bled into my cuticles like oil. I really like the colors but the application is such a pita it ruins them for me. DYIT, however, was fabulous-ness in a bottle. It dried quickly, was easy to control and had such a shiny finish that I didn't even need topcoat! That one was yummy! I wasn't going to buy those delicious juicy polishes. I didn't think about the VNL that I WON'T have! My nails are nubs so I don't have to worry about a VNL. Where is my brain? Don't Mess With OPI is my favorite. I just can't stop buying all greens I can! I'll be buying much more of this collection than I was going to. Congrats on you fingers being in Shape Magazine! Woo hoo!!! Your famous girl! Love these swatches!! tnQ! And by the way, isn't that one calls Too Hot Pink To HOLD'EM? Instead of Too Hot Pink To Handle?.. Like Medusae said... Texas first, America second. The flag IS everywhere, and not one color represents it. I've lived in Texas for the past 20 years (I'm 24) and I can tell you it appears nobody that helped create this collection has ever set foot in this state. I'm not what you would call a "proud Texan," but this is bad. Sheer turquoise for Austin? I'd get it if it was a bold green or the color of the lake (or burnt orange... lol). The San Antonio one should be the color of the Alamo, but, as usual, OPI picks colors that are fashionable rather than unique or historical. Nobody-- NOBODY-- says "Y'all come back now..." We do say y'all, but that's it. These colors don't represent anything about Texas. Gray for Fort Worth? Why? It should be the color of steak :D Suzi Loves Cowboys looks like I'm Suzi and I'm a Chocoholic. I think Suzi likes the color brown, not cowboys or chocolate... *rolls eyes* For a state this big that represents areas from desert to tropical, and people of all colors (lookin' at Houston right now), these colors are pretty bland. I would have picked colors that represented the Alamo/San Antonio, Galveston (or Corpus Christi... that's easy to name one after), El Paso, Austin, DFW, Lockhart, and Lubbock at LEAST. Then three for the flag, or a blue based shimmer with red glitter, etc. It just seems to me that OPI doesn't care about representing the areas it creates colors for or about. My brother saw the Suzi Love Cowboys and said "Shouldn't it be Cowboys blue?". Agree this collection doesn't represent Texas at all. And Lubbock should be dust colored lol. I have the "lil shooters" from this collection and I agree, "Austin-tatious Turquoise" really is a nightmare, though you really can't tell in your picture. I had so much trouble with that polish..ugh. @lacquerbitten: the same goes for all the collections I think. The Hong Kong Collection has nothing to do with Hong Kong either..
Wow, isn't that interesting about the formula? My Austin-Tatious & Fort Worth-It polishes were absolutely fine - two or three coats. But my "sorbets" were like water. Literally, there was no way they were ever, ever going to become opaque. I'm sad, as yours look amazing! I'm a native Texan and I have such mixed emotions with this collection. Some of the names make me want to scream with laughter and others make me want to smash the nail polish bottles. I feel like the sorbet colors, while pretty, are so similar that one will suffice. My favorites are San Tan-tonio, Suzi Loves Cowboys, and Don't Mess with OPI. I just love earthy tones. Those names piss me off, though. I don't give a rat's behind if Suzi loves cowboys because Suzi is not Texan and probably doesn't even know what a real cowboy is. Shooooot. 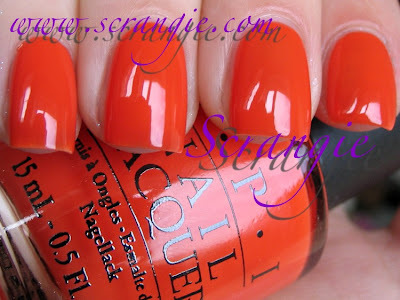 I also hate Don't Mess with OPI because, damnit, you can't steal our catch-phrase! Sorry for the Texas rant, but I wanted so much to love everything and was let down. As a previous commenter said, a lot of them feel like stereotypes. And several commenters came up with much more unique and beautiful ideas. I'll grab a few from this collection, because I'm still sentimental and PROUD, but I think we could've done a lot better. I only have San Tan-tonio and I LOVE it!! I always thought this is what OPI Barefoot in Barcelona should have been. I may get "Don't Mess with OPI" just because it's a little more muted than Essie Pretty Edgy but lighter than Essie Going Incognito. I agree with everyone who said there should have been a Houston reference. Maybe a shimmery, oily black. I'm from San Antonio, and I still don't really want San Tan-tonio. I mean, the name's great for hometown pride, but the color is so boring. I have Big Hair, Big Nails, though, and it's pretty. Sadly , no eye-catching greens in this collection! I have the Lil Shooters set and have just had an "entertaining" time herding I Vant Etc round my nails! It looks better now I have top coat on than it has a right to, really. It fought bitterly with my base coat and didn't want to lay down. Am looking forward to trying the others though. Great shots by the way, thanks for posting them. Update to my earlier comment: just trying "Houston" and having a nightmare! Thin is too thin, thicker goes lumpy and floods. Help! Do I have a bad bottle or is this normal for a jelly? Finding it really hard work. Heya StripyJules! I'm having a little bit of a hard time figuring out the issue... Are you saying that if you try to apply thin coats of it, it's too thin? Or did you thin it with polish thinner and now it' too thin? I find that the best way to apply jellies is to do as thin of a coat as possible each time and then just do 3-4 coats until you reach desired opacity/intensity. Wait a few minutes in between coats so it doesn't clump up. My bottle is new, just opened and un-thinned. The texture seems very odd but this is the first jelly I have tried. It doesn't coat the brush evenly, giving a bare top and virtually a droplet on the end of the brush. When I apply to the nail, the coat is either so thin as to be too dry to coat the nail surface (and I have small nails), leaving gaps. If I try and patch the gaps, the brush drags off what I've already applied and leaves blobs elsewhere. I've persevered and did get a good finish in the end (with topcoat), but man I find it hard to work with! It's either not there, or it's flooding. I did wonder if it didn't "like" my base coat, maybe I'll try a different one of those next time. Or maybe it's a faulty bottle. Update to update: I have just remembered I own a mini of Texy and have just taken off Houston to try it out...it applies TOTALLY differently and is going on really easily. Same base coat as before. Have to say though Houston lasted REALLY well once I'd got it on! hi!! how do you compare "do you think im tex-y" with "ate berries in the canaries"? i already have "houston we have a purple" and i didn't want to buy the tex-y cause i think they will be to similar so i bought the berries one and is very close to the houston one!! hi! i already have "houston we have a purple" and i want "do you think i'm tex-y" but i see both here and they look very similar so i bought "ate berries in the canaries" wich is SO similar to houston!! This is really going to make me sound as old as I AM, but the "Vant" is a reference to Greta Garbo... she was a famous actress, a long time ago... also famous for saying to the press "I want to be alone," and her accent made the "want" sound like "vant." What does that have to do with Texas? Well, she was a STAR!... and a LONER!... Lone Star.